FILE - Security forces inspect the site of an Islamic State-claimed attack on a hospital in Kabul, Afghanistan, March 8, 2017. The United States reiterated its resolve Thursday to help local forces eliminate Islamic State from Afghanistan and strongly refuted accusations Washington was behind the emergence of the terrorist group in the war-shattered country. The remarks by the U.S. ambassador to Kabul, John Bass, are the first formal reaction to the repeated accusations in recent months by some Afghans, including former President Hamid Karzai, along with Russia, that U.S. troops are aiding IS militants in Afghanistan. "Let me take this opportunity, since these rumors continue to circulate, to emphatically state that the United States has not brought Daesh to Afghanistan. The United States has not ever supported Daesh, its creation, its horrible attacks in any form, or fashion," said Bass, while addressing his first news conference in Kabul. FILE - Former Afghan President Hamid Karzai speaks during an interview with the Associated Press in Kabul, Afghanistan, April 17, 2017. 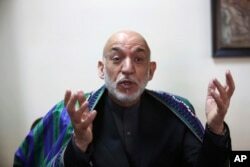 In a series of interviews to media groups, including VOA, late last year, Karzai called IS a "tool" of the U.S. The former Afghan president repeated his allegations Thursday in India, saying it was up to the United States to explain the rise of Daesh and extremism in his country. "Some of Afghanistan's problems are foreign. Extremism is the product of U.S.-Pakistan cooperation, and Afghanistan has to face implications. The U.S. must explain," Karzai said in New Delhi while taking part in a geopolitical conference known as the Raisina Dialogue. U.S. Ambassador Bass said there was "absolutely no way" to work out peace or reconciliation with Daesh in Afghanistan. "The only way to deal with Daesh is through sustained determined efforts on the battlefield to either kill them or capture them and to remove them to prevent them from being able to conduct attacks," said Bass. The U.S. ambassador said that was the approach the U.S. and other coalition members undertook in Iraq and Syria in partnership with the Iraqi government and with Syrian groups that were committed to defending their part of Syria. IS operates in Afghanistan under the name Khorasan Province. The terrorist group launched its operations in early 2015 from eastern volatile Afghan regions, mainly Nangarhar province bordering Pakistan. Since then, the group has extended its activities to other parts of the country, including northern Afghan provinces bordering central Asian states, which is raising alarms in Russia. IS has claimed responsibility for some of the recent deadly suicide bombings in Afghanistan, particularly in the capital, Kabul. The violence has left scores of Afghans dead, mostly members of the minority Shi'ite community. U.S. military commanders say former members of the Pakistani Taliban comprise a majority of IS fighters in Afghanistan. Pakistan alleges IS bases in Afghan border also are behind terrorist attacks against the country. Afghan officials deny the allegations and say IS militants receive support from Pakistan.